The Voting Rights Act  was passed in 1965 to ensure state and local governments do not pass laws or policies that deny American citizens the equal right to vote based on race. On June 25, 2013, the Supreme Court swept away a key provision of this landmark civil rights law in Shelby County v. Holder. In April 2010, Shelby County, Alabama filed suit asking a federal court in Washington, DC to declare Section 5 of the Voting Rights Act unconstitutional. 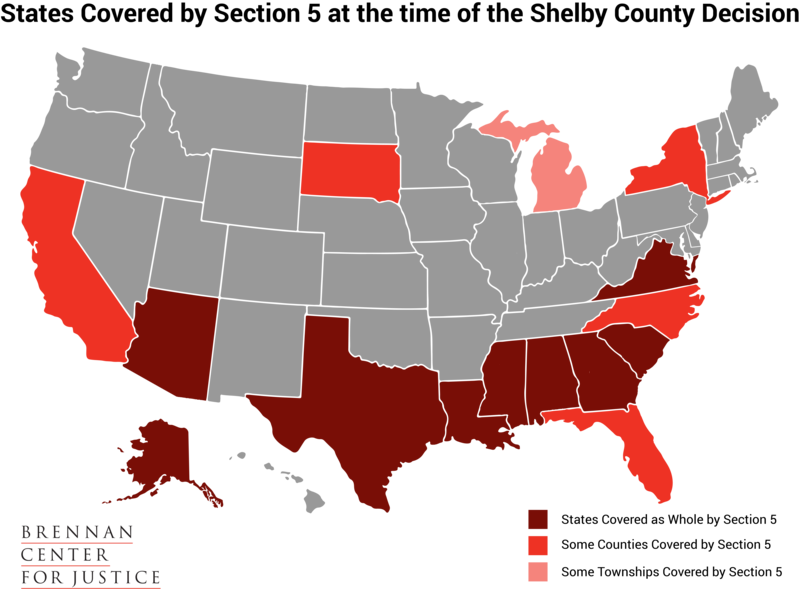 Section 5 is a key part of the Voting Rights Act, requiring certain jurisdictions with a history of discrimination to submit any proposed changes in voting procedures to the U.S. Department of Justice or a federal district court in D.C. – before it goes into effect – to ensure the change would not harm minority voters. In September 2011, the U.S. District Court for the District of Columbia upheld  the constitutionality of Section 5 of the Voting Rights Act, and in May 2012, the U.S. Court of Appeals for the District of Columbia Circuit agreed  with the district court that Section 5 was constitutional. Shelby County appealed the ruling to the Supreme Court, and the Supreme Court agreed to take the case in November 2012. On June 25, 2013, the Supreme Court ruled  that the coverage formula in Section 4(b) of the Voting Rights Act — which determines which jurisdictions are covered by Section 5 — is unconstitutional because it is based on an old formula. As a practical matter this means that Section 5 is inoperable until Congress enacts a new coverage formula, which the decision invited Congress to do. The Brennan Center’s statement on the decision is available here . The Brennan Center for Justice, alongside many other partner organizations, submitted amicus briefs in the case. All the amicus briefs submitted in the case, including the Brennan Center's brief, alongside the Supreme Court documents can be found in our Shelby County v. Holder case documents page . For more information on the precursor case to Shelby County, NAMUDNO v. Holder, click here .